In history, the Vikings were Norse explorers famed especially for their ruthlessness in combat and appearance. Although there are quite a few debates regarding the savage image that we associate the Viking Age with, there’s no doubt that their looks are one of a kind. 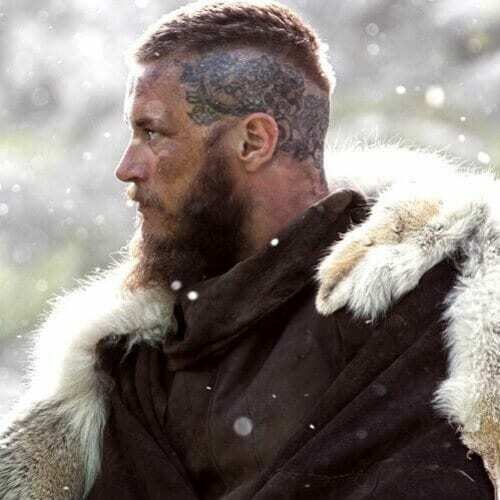 Discover all the Viking hairstyles we have picked out, from traditional Scandinavian haircuts to modern adaptations you can try out today. Be that as it may, the Viking appearance that we are all accustomed to can be best described as rugged. With long hair, rugged beards, and fierce attitudes, Vikings are generally associated with images like the one shown above. 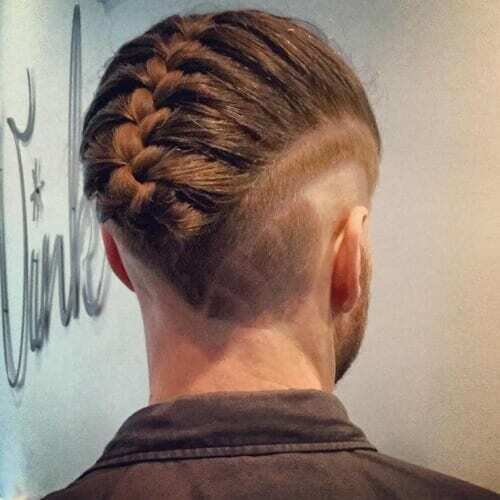 What if you want a Viking-inspired hairstyle that is adapted to modern times? Always opt for a full beard, but ensure that it’s permanently well-groomed. In addition, you can allow your hair to be medium or long, even surpassing the shoulders. 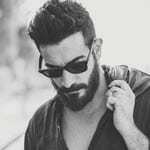 Man bun hairstyles have been extremely popular in the past few years, particularly among guys with long and thick hair. 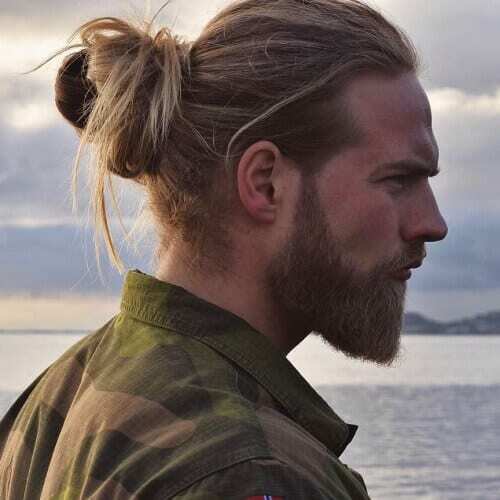 If you plan on sporting a Viking-like look on a daily basis, a hairstyle like the man bun will become necessary for its practical and aesthetic benefits. Alternatively, you can switch to ponytail hairstyles from time to time. 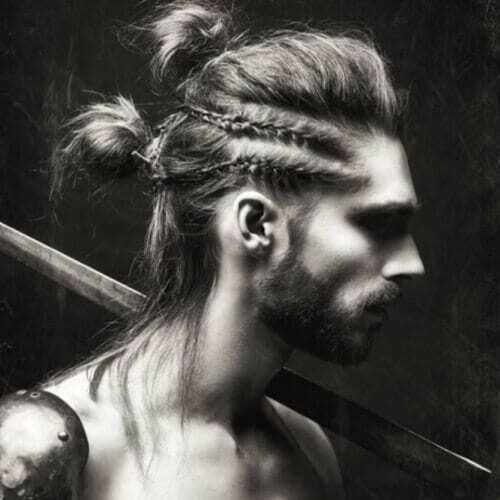 The long side locks, braids and overall long hair in the style above instantly make you think of Vikings. Try out this look if your hair is long enough, and especially if it’s naturally straight. 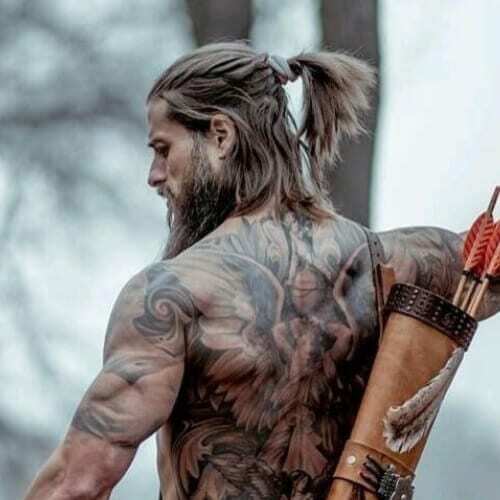 It’s pretty clear by now that the majority of Viking hairstyles are based on long hair and thick beards. In this case, if you already have both, you can feel free to leave them as they are, including your hair directly down. 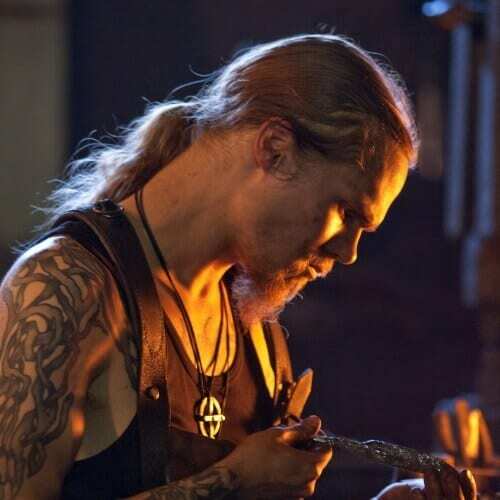 Undercut hairstyles for men also play a significant role among Viking hairstyles. 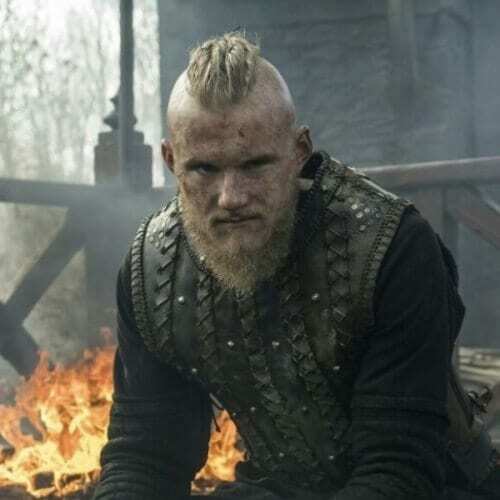 Generally speaking, you’ll find a lot of hairstyles associated with Vikings to include large, skin fade, disconnected undercuts. You can rock yours with a man bun to show off the shaven part. 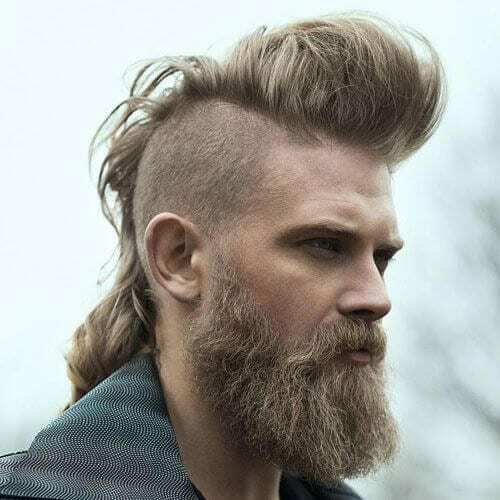 If you want your Viking hairstyle to have even more of a bad boy edge to it, go for a mohawk. 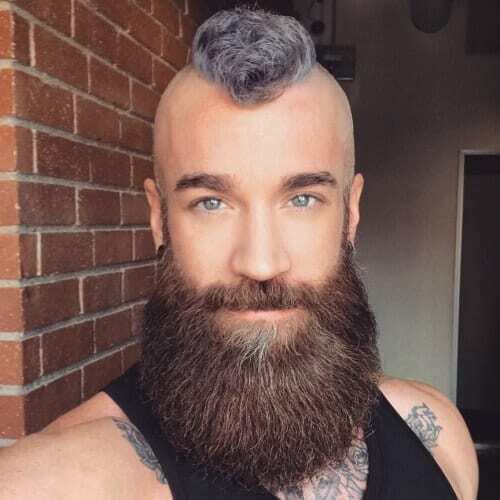 Although we don’t particularly recommend fanned punk mohawks for the Viking aesthetic, we do encourage you to opt for wider mohawks and fully shaved sides. 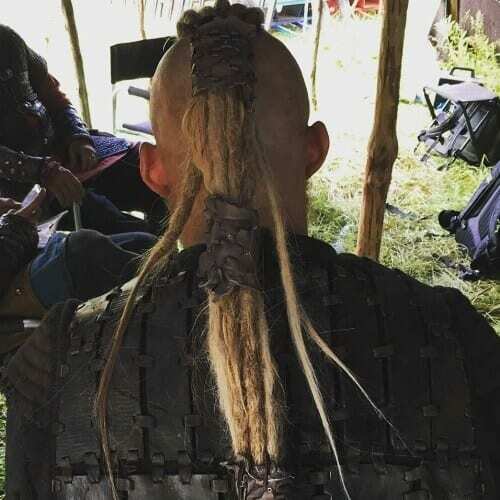 The difference in one’s appearance will always be in the details, whether we’re talking about Viking hairstyles or any other looks. That’s why we suggest finding the best subtle elements to get your message across, such as the two thin braids pictured above. 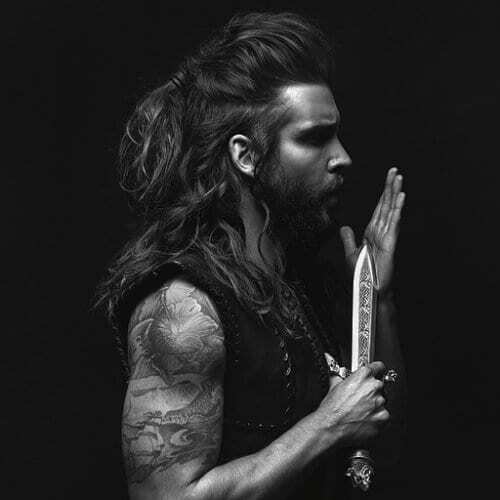 Are you currently rocking a Viking-inspired hairstyle with an undercut and long hair? You can further experiment with styling by wrapping your long locks into a ponytail in the back. The back-braided halo is also a nice touch for the final results. 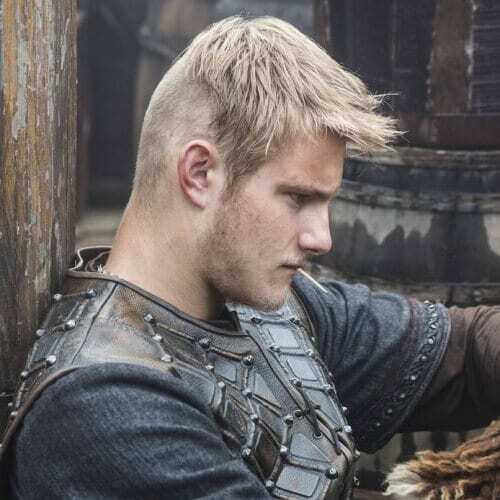 We all have to be honest – the TV series Vikings is the main reason why Viking hairstyles are currently topping the trend charts in men’s hairstyles. 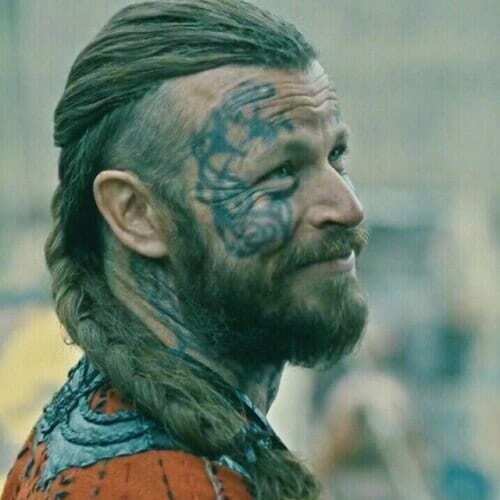 Bjorn is just one of the characters on the show that is a clear reference for a cool Norse hairstyle. Want your hairstyle to exude extreme edginess? Try out a Viking mohawk with long, heavily teased hair. You can easily achieve the look by backcombing the top part of your hair and using some product to make sure it stays in place. What if you love Vikings, but aren’t up for dealing with the maintenance that comes with long hair? 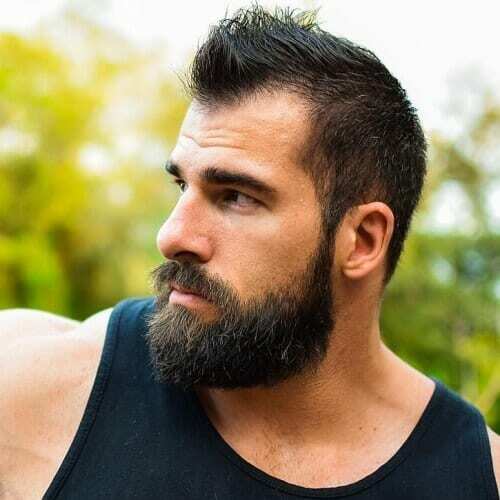 You can combine your rough beard with an easier haircut, such as the crew cut. You can add an undercut to the mix for more style. 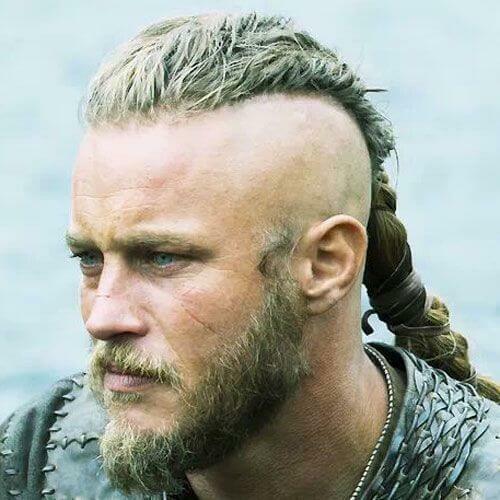 Another memorable character from the Vikings series is Ragnar, especially when it comes down to hairstyles. He shows that shaved sides hairstyles for men are just as fierce as they sound, and even more so when you combine them with a longer top. 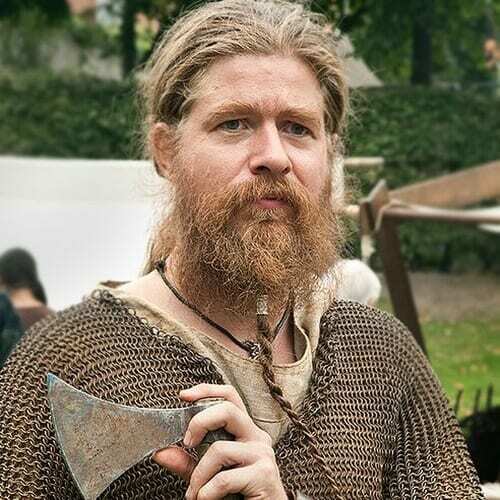 Some guys prefer simplicity, while others enjoy using their imagination for their Viking hairstyles. In the example above, you can see a creative and complex mohawk updo, with two large knots. The side braids help get the mohawk effect. What if you can’t choose between short and long hair? You can pick a Viking hairstyle that features both. For the top part, cut your hair shorter so it will be easier to handle. As for the back, either leave your hair down or get dreadlocks. 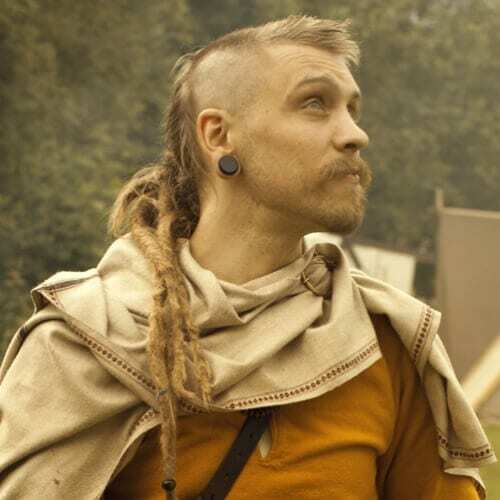 Not all Viking hairstyles are as unruly as you’d expect them to be. 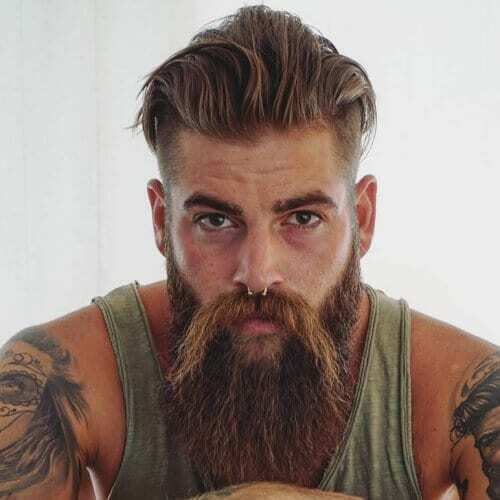 Even though many involve scraggy beards and long hair, it all narrows down to the way you choose to style them. Try out the sleek hairstyle and beard style above for a sleek look. Braids appear in a multitude of hairstyles associated with Vikings. Whether the long hair is woven into a single braid or just sections of it are braided, the results will look fantastic. You can even add numerous braids throughout your hair. Not all of those who explore Viking hairstyles have super long hair. In fact, quite a few have pretty short locks to begin with. If your hair resembles that shown in the photo above, you can opt for an easy short ponytail with an undercut. There are few hairstyles that have such a big visual impact as the undercut with the long top shown here. The key to mastering the hairstyle is to allow your hair to grow down to your chin and then shave the sides and back. 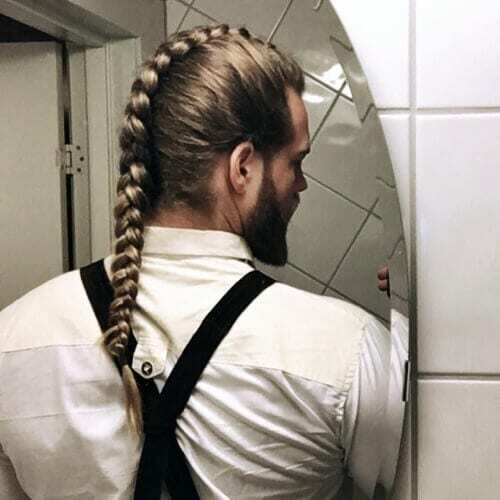 Let’s say that you love wearing Viking hairstyles in your free time, but that you have a corporate job to deal with during the day. In this situation, you can go for a business casual hairstyle with a neat man bun and trimmed down beard. 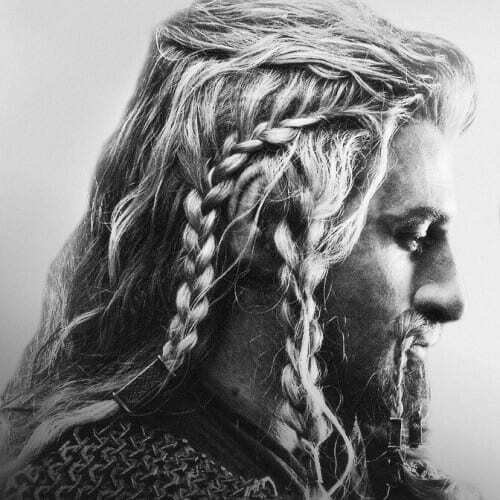 Thanks to the length of your Viking-like hair, you have plenty of creative hairstyles you can test out. Aside from all the man buns and ponytails we talked about, you can also have fun with half up half down hairstyles. 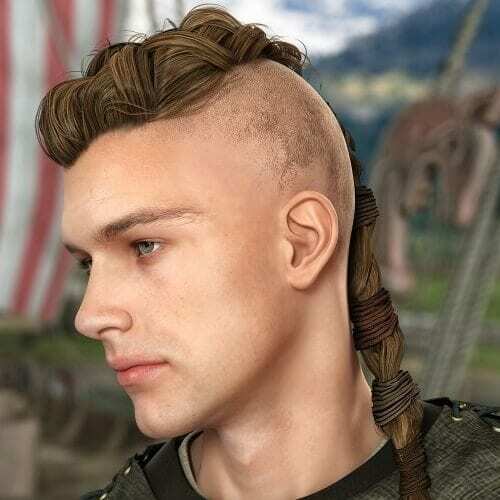 Here is another great Viking hairstyle for men with short hair that don’t want to get too flashy with their appearance. 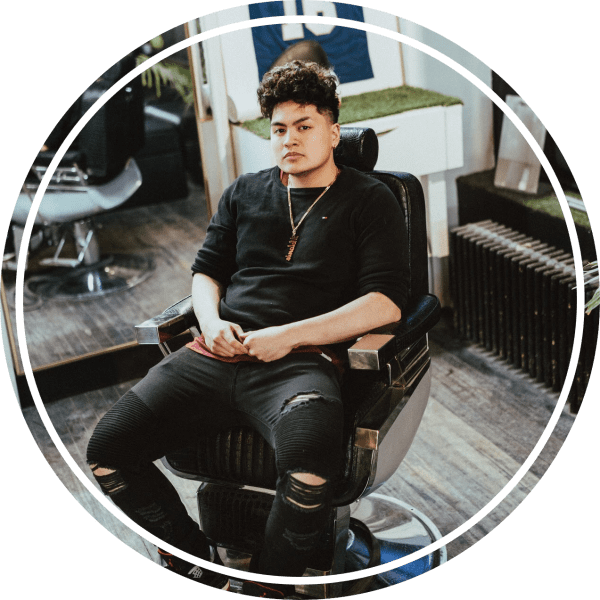 All you have to do is style the top part of your hair to resemble a mohawk, which you can accomplish with some strong hold hair cream, gel or wax. Facial hair is just as important for getting the Viking look as the rest of your hair. If you have the necessary patience to grow a long beard, you can start styling it with Viking elements. The long twist pictured above is a nice example. You may not want your hair to be all over the place all the time. For this, we recommend a Viking look with an upbraided hairstyle. After braiding the top, you can tuck the tips under the main part with a few hairpins. 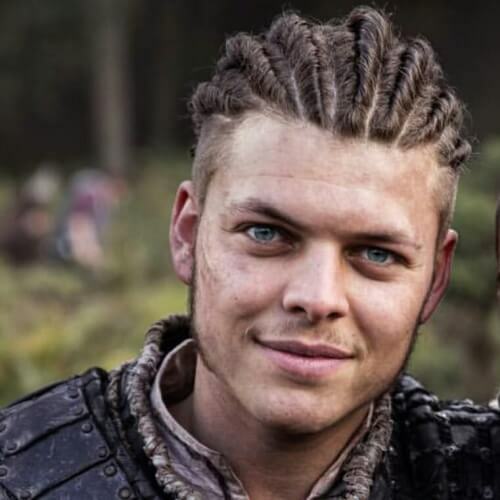 We’re back to the Vikings show with this idea, this time with one of Ivar the Boneless’ hairstyles. Alex Høgh Andersen, the actor that portrays Ivar, shows that you can use a twisted hairstyle instead of a fully braided look. 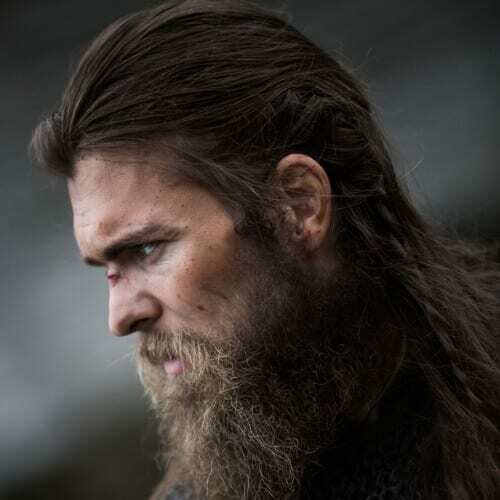 With most Viking hairstyles, it’s all about maintaining a ragged and manly appearance. Often, it means styling your hair messily, without giving it too much attention. 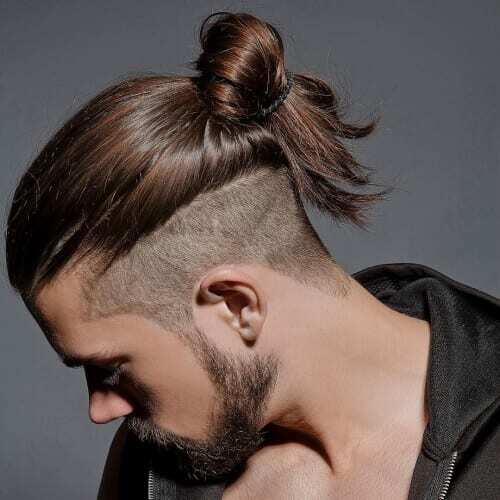 A disheveled man bun is just what you need, particularly if your hair is cut in layers. The fun part about Viking hairstyles is that you can mix all sorts of elements, such as braids and ponytails. When you have more time on your hands, you can braid the top portion of your hair and wrap the rest in a ponytail with multiple ties. As an alternative, you can choose a half up hairstyle with braids. The cool part about this hairstyle is that you’ll get a mohawk effect if you braid your top locks properly. Moreover, the look is adaptable for formal and everyday situations alike. You may not be in the mood for extravagant hairstyles every day. However, you can still add a Viking touch to your look without wasting a lot of time. Simply tie up a part of your hair and make a thin braid on one side. 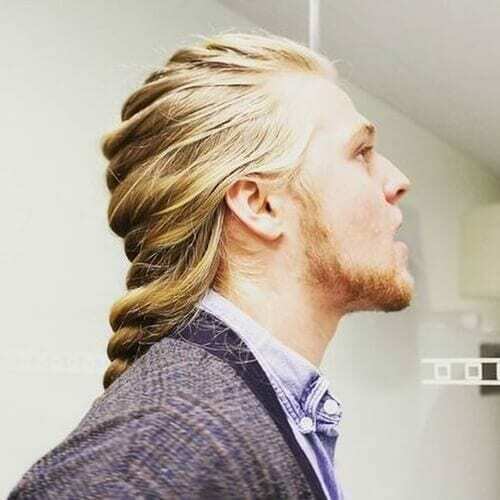 If you didn’t resonate with the other office-friendly Viking hairstyles we presented, here is one that you might enjoy. 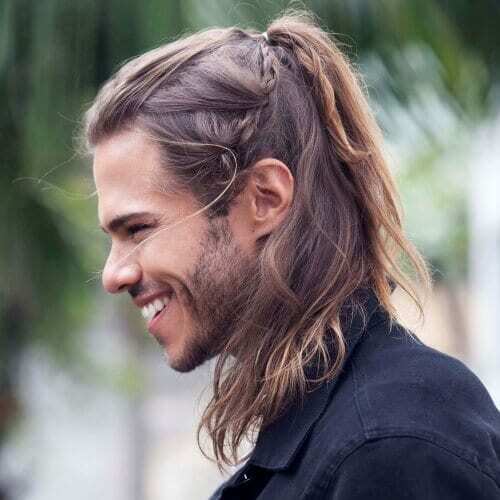 We recommend it as an easy hairstyle for guys with long hair, with just a bit of twisting to pull the locks back. Cornrows are undoubtedly one of the most popular braids for men out there. 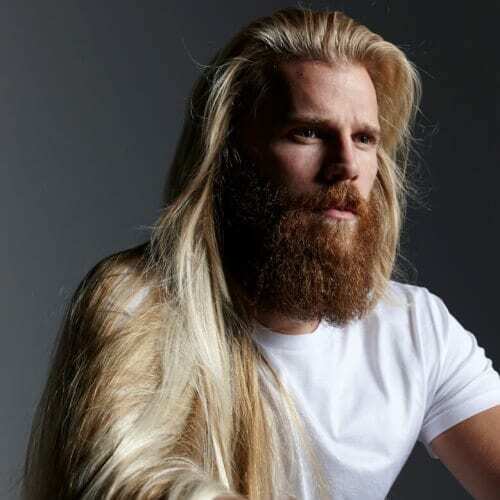 They look amazing on all sorts of guys, whether or not they have Viking-like beards. If you want to mess around with your look, cornrows are definitely the way to go. Never forget about the beard, fellas! If yours is notably long, you can have just as much fun styling it as you do with your main hair. 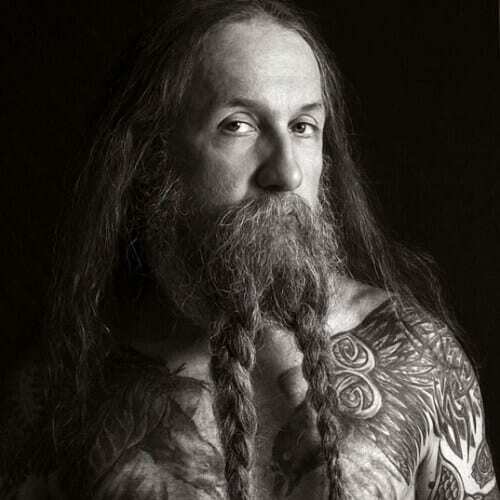 To get a Viking vibe, consider sectioning your long beard in two and braiding each part separately. 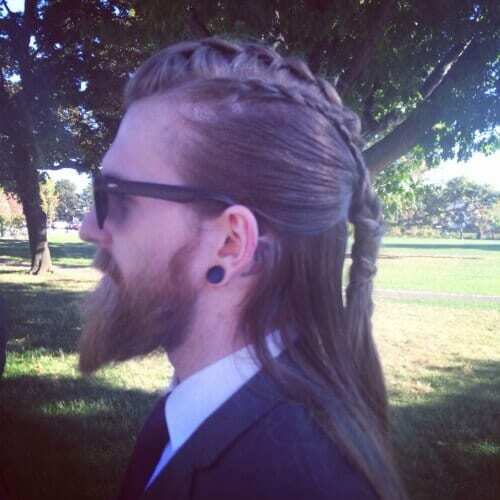 You don’t have to be a 30-year-old to get a great Viking hairstyle. In fact, the look will flatter men of any ages. 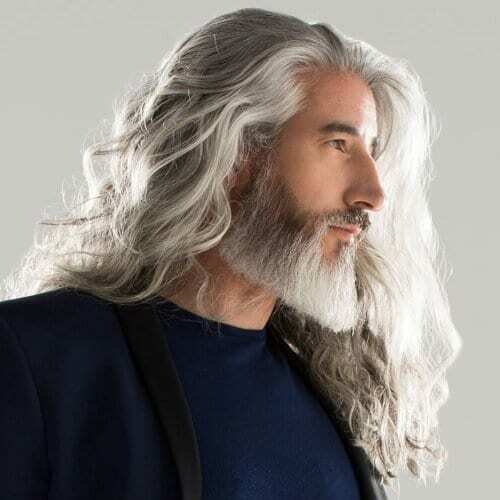 If you’re a senior, we encourage you to let your hair and beard grow for an awesome rugged look. 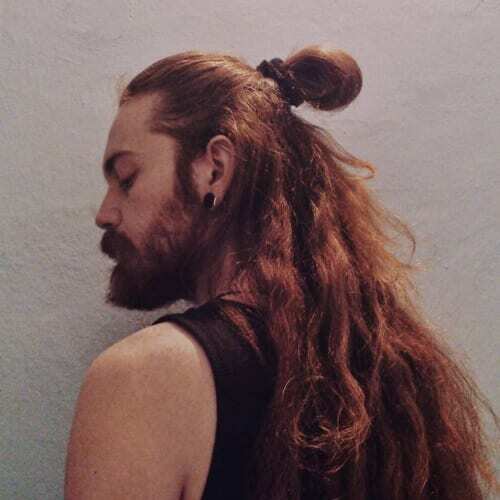 We have already made it clear that man buns are extremely popular with Viking hairstyles. 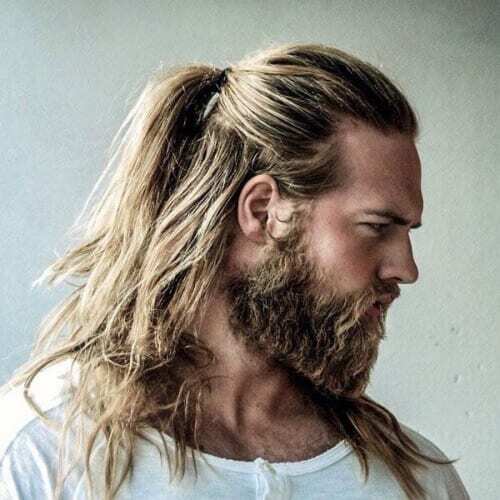 Nevertheless, if you want to boost the Norse touch of the hairstyle, think about leaving half of your hair down with your man bun. Not all Viking looks have to include tight braids or dramatically shaven sides. Quite the contrary – many of them are actually loosely styled. 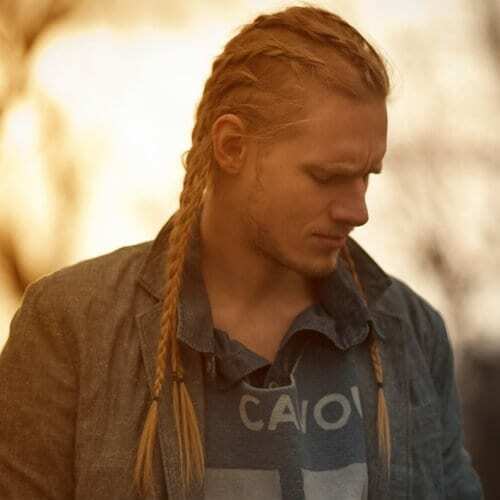 If you want to look cool while remaining comfortable, opt for a loosely braided Viking hairstyle. 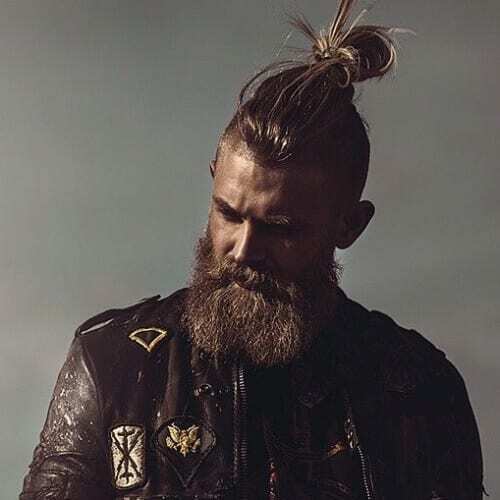 All you need is the right approach to styling to get a Viking-inspired hairstyle. The swept-back look above, for example, are perfect for men with any hair length. Casually comb them back and add a touch of product. 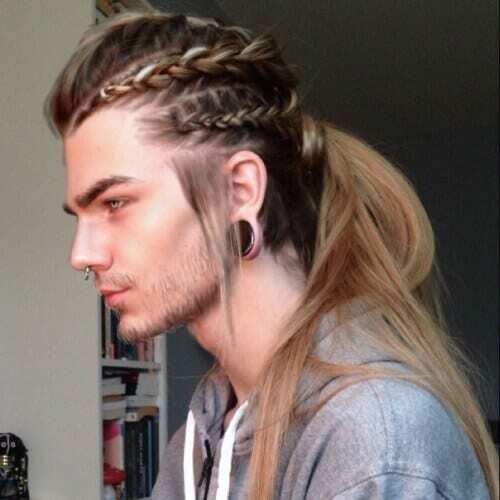 The Viking hairstyle here can be rocked in practically any setting. Not only is it easygoing and softer than most, but it’s also simple to achieve. Your hairstyle will definitely attract the admiration of those around you. Not everyone is quite up for the idea of shaving the sides of their head for a real mohawk. 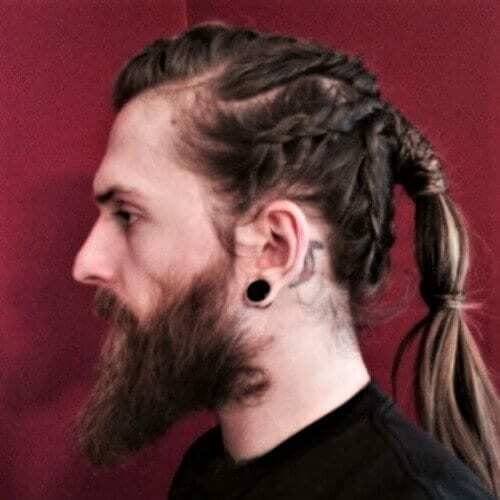 Still, you can get a similar look with even more of a Viking vibe by braiding the sides. Feel free to style the top in a messy mohawk. 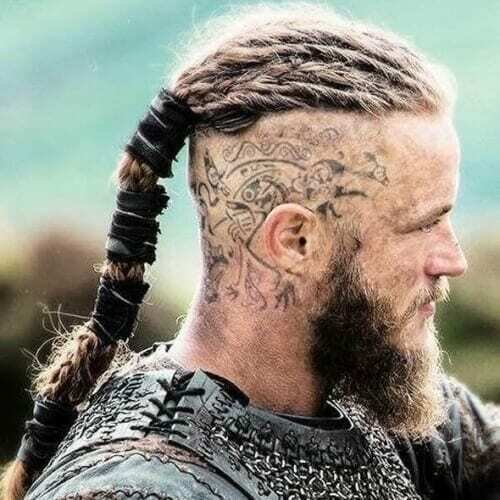 Whether you already have a head tattoo like Ragnar or you’re interested in getting one, know that it will look awesome with a full undercut and long top. You can also recreate the look with temporary tattoos for a special occasion. 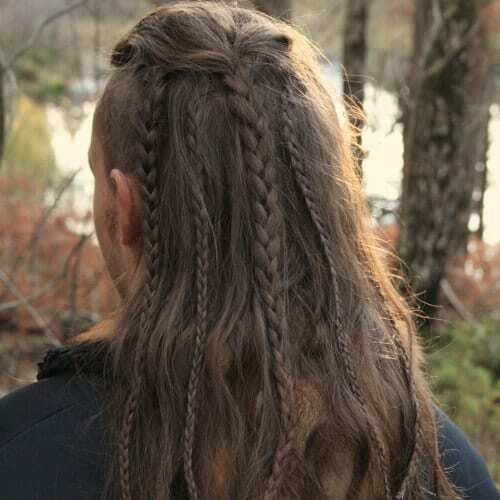 Once your hair is at least shoulder length, you’ll have an easier time finding Viking hairstyles. If yours is medium, you can grab a large part of the top part and quickly tie it in a ponytail. It’s practical just as much as it’s visually-pleasing. An alternative for guys who don’t want genuine head tattoos are hair tattoos. A barber can create shaved designs in your undercut to make it seem as if you would have real tattoos in that area. The long mohawk is a terrific touch. 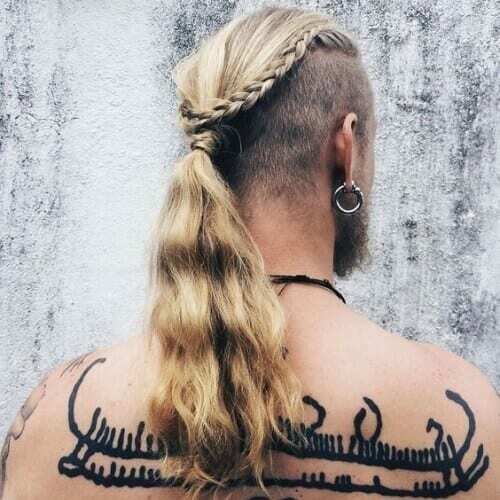 Want a Viking hairstyle that’s simple and effective? You can never go wrong with a low ponytail. It won’t make you stick out like a sore thumb in fancy situations, and you’ll also be comfortable while wearing it. You can instantly get a cool Viking look if you use braiding techniques. Oftentimes, if you have long hair, you just need to braid the sides and leave a few braids down to get the perfect look. Tease the top for a mohawk effect. 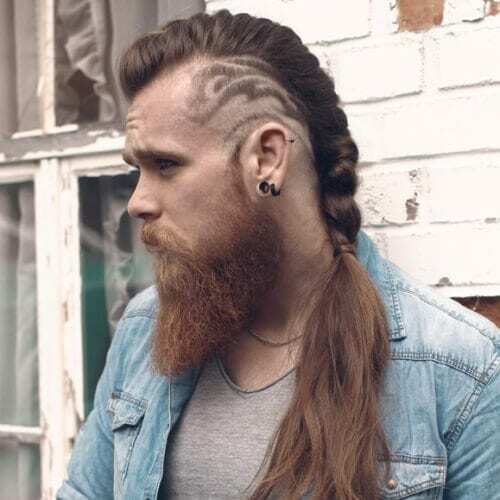 If you’re looking for an authentic Viking look, you may want to consider using the undercut with long hair idea. You can use your length to your advantage and create a long braid to the side. The hairstyle works for men with any hair texture. A traditional Viking hairstyle may not be appropriate for certain social situations. A wonderful way to style long hair in these cases is with a classy, pulled back braid. Look into Dutch braiding styles to learn more about the technique involved. 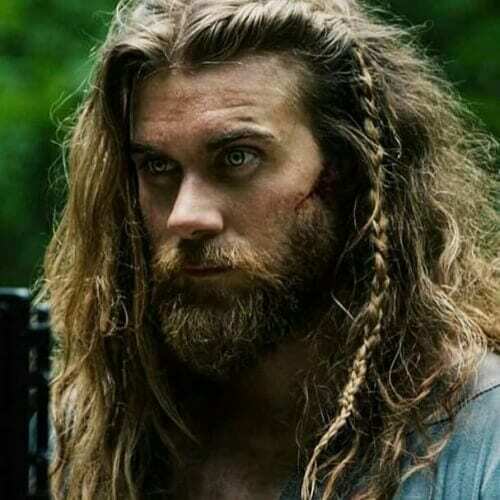 Volume is great for getting the rugged aspect connected to Viking hairstyles. Although you may not have naturally thick and voluminous hair, you can get the same results with the right styling methods. Backcombing, teasing, and tying will help you get there. 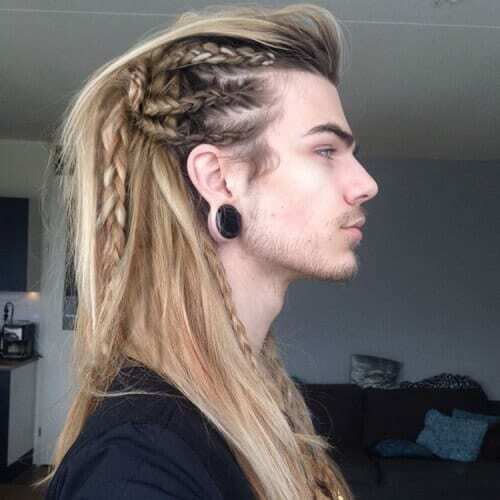 Dreadlocks are amazing for boosting the edginess of you Viking hairstyle. You can either style your natural hair into dreadlocks or get long extensions with your hair color. Use hair ties down the dreadlocks ponytail. The high and tight haircut is one of the most well-known military hairstyles we have. However, it can be used for a intriguing Viking hairstyle for shorter hair. Shave everything down until you get to the upper sides of your head and leave choppy hair on top. 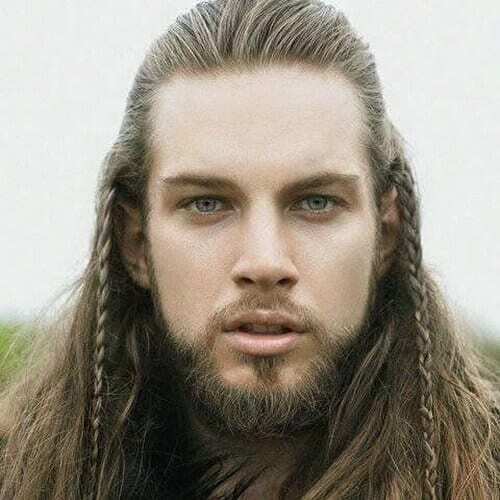 Our last idea has all the elements that a Viking hairstyle should: long hair, loose braids, and messy styling. It proves that hairstyles from this category are all about keeping it cool and not caring too much about the end results. This image might be computer generated, but that doesn’t diminish the hairstyle. Look at that nice braid tied with leathery strings. It’s perfection! 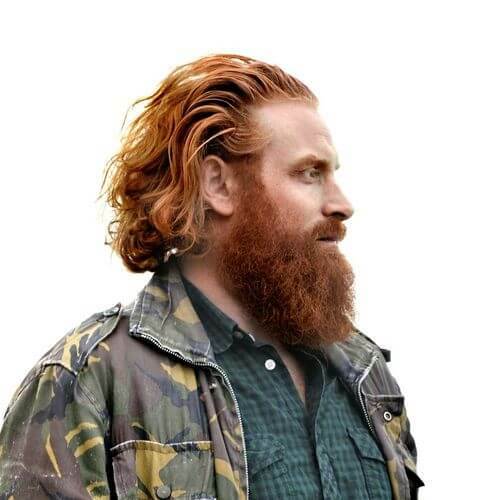 Going beyond the wall, if you’re going for that viking wildling look, this style is perfect. Bonus points if you’ve got ginger hair and beard. Trying that evil wizard look? Your friends might shun, your family might disown you, but you’ll look cool. And you’ll be able to throw firebolts at your enemies. 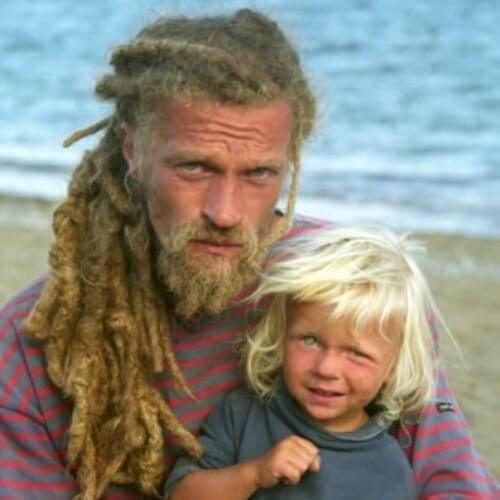 Blonde dreadlocks are a historically accurate way of going for a viking hairstyle and they’re not, as some would call them, cultural appropriation. Bonus points if you have a kid as cute as that one. In summary, Viking hairstyles are a fun way to express your admiration for Scandinavian culture and the seafarers that went down in history. 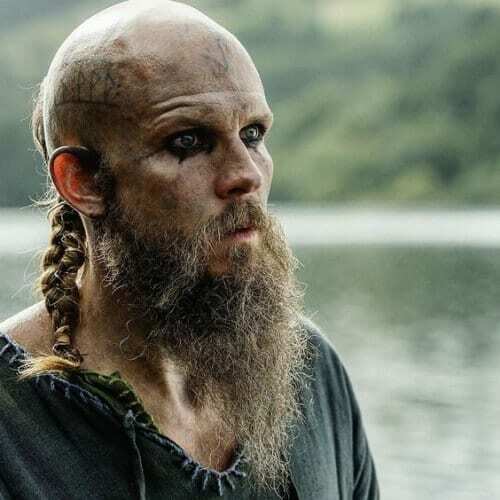 Whether you’re a huge fan of the Vikings TV series or you love the way rugged hairstyles look, we’re sure you’ll find at least one reference to match your tastes. 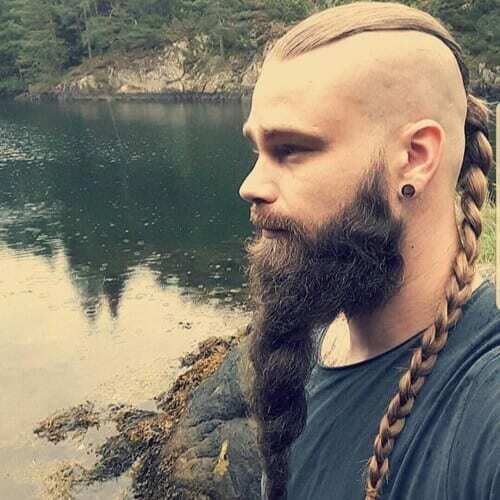 Would you go for a classic Viking hairstyle or a modern one? Tell us all about it in the comments below! Thanks so much for your input! This particular piece was never intended as a historical article on the Vikings. Our website is dedicated to offer styling advice to men not history lessons, and this article contains ideas on how men can style themselves according to the current ‘Viking’ trend. For historical evidence, please check out educational websites at your leisure!